Located in the southern part of Lancaster County, along Route 741, Strasburg is an old-fashioned village with well-preserved 18th and 19th century brick architecture and charming old stone homes along tree-lined streets. Starting out as a tiny village of log houses, about two dozen of the original 18th century log cabins still exist today. One of the first sights you may notice when you approach the town is a number of horse-drawn Amish buggies traveling along the narrow and twisty back roads surrounding the picaresque farmland. 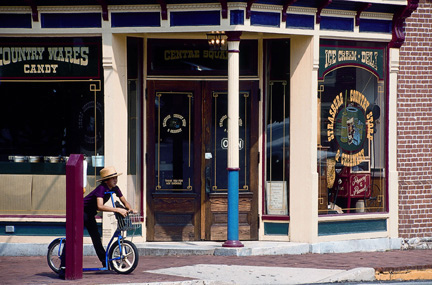 While the Amish have a large presence in the town today, Strasburg was actually founded in 1693 by French fur traders who traded with the Delaware Indians. Later, French Huguenots settled in the town which began as a small group of log houses. These French Huguenots came from Strasbourg, in the Alsace region between France and Germany, which traditionally served as a haven for political and religious dissidents from other parts of Europe. Due to the location of the region, the culture of the French Huguenots was influenced by both France and Germany and most spoke both languages. As these French and German settlers emigrated to America, they named their New World home after their old home in Europe. This appears to be a common tradition followed by European immigrants during this time period. The new town gradually grew and became an important trade center in between Philadelphia and Lancaster. As a result of the increase in traffic, many taverns were established to provide accommodations and entertainment to the weary travelers. The town even gained a reputation of being somewhat rowdy, and became known as "Hell's Hole." This heavy volume of stagecoach and wagon traffic started to decline with the construction of the Lancaster Turnpike in 1795. The new route directed much of the trade traffic away from Strasburg and slowed the commercial development of the town. In 1832 the Strasburg Railroad was charted to connect the town to provide passenger and freight service. It is the oldest continually chartered public railroad in Pennsylvania. During the first half of the 1800s, the town tried to clean up its rowdy past by establishing several schools such as the Strasburg Academy and the Strasburg Scientific Society. This period also saw the development of a post office and some churches. In 1856, Massasoit Hall, named after an Indian chief who befriended the early pilgrims, was constructed. This brick building became one of the town's first public meeting spots where the townspeople gathered to discuss public events and attend cultural activities. Today, the town is a must-see for train lovers and children of all ages. Old-fashioned locomotives from the 19th Century can be explored at the Railroad Museum of Pennsylvania. Also, authentic train layouts and other train memorabilia are on display at the Choo Choo Barn and National Toy Train Museum. To top it off your trip won't be complete until you take a scenic ride through Amish Country on one of the restored railroad cars. If you're thinking about visiting Strasburg any time soon, you might be interested in learning about some of the special Strasburg events that will be taking place during the upcoming months. Historical Strasburg is a charming little town with interesting museums, pleasant restaurants, attractive architecture, and quaint Bed & Breakfasts. There is always plenty to see or do. Even if all you are looking for is a pleasant place to take a laid-back stroll and soak up some atmosphere, Strasburg is for you. And, come to think of it, what's wrong with that?